An Excerpt from "Off Track"
Gary thrust Butchy into his back pocket. He couldn’t see through the puffed bruise of his right eye, but he felt it all the same. He carried the dead weight of the gun with him and inched down the stairs, step by step, following his mother’s terrified screams. Her strained voice echoed off the walls and bled through the pores of the house. For years those screams defined the house. They oozed at every moment, even through the silence. It seeped into Gary’s ears. His thoughts, in those moments, weren’t his own. The world wasn’t real to him anymore. The air felt strange, as if swirling around him like a giant whirlpool, floating him toward some inevitable force intending to smash him to bits. Then it rushed him head on. At the bottom of the stairs, he stumbled to the entrance of the kitchen and poked his head around. His mother leaned on her knees before his father, her hands clamped onto his pants leg for support. She pleaded with him, crying like Gary had never seen her before, molten tears pouring through her eyes and streaming down her raw face. His father struck her hard across the cheek and the slap echoed against the walls like a hand on wet concrete. Gary fingered the gun and lifted it slowly. 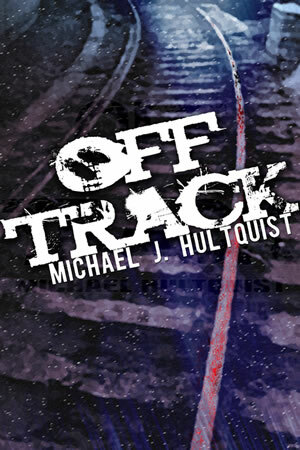 Off Track is a classic story of a guy getting out of the joint and trying to go straight in the face of circumstances and people who conspire against him. In this case, though, the ex-con is only 16 years old. Gary Sanderson had been in an Illinois juvenile facility called Radcliffe for four years after having killed his father in a morally justifiable, if illegal, shooting. Now he wants nothing more than to make a decent life with the nice young foster parents whose decision to take him in shaved two years off his sentence. Oh, and he also wants a relationship with the neighbor girl whose father has forbidden him from coming anywhere near her. Gary’s legal status leaves him vulnerable to those who enjoy preying on the weak, from an over-familiar male guidance counselor, to schoolyard bullies and an arrogant, tone-deaf cop. Inevitably, Gary must make a decision that – again, even if morally defensible – could land him back in juvenile detention or worse. Readers may think they understand the alternative ways the situation could be resolved, but author Michael J. Hultquist has thought of a few more. Hultquist lets the book unfold in its own time. He said he was seeking “a slow boil that bubbled to the surface in one final crescendo.” And that’s pretty much what it does. It’s a good story for readers who don’t require instant gratification and can find satisfaction in considering Gary’s various ethical and practical dilemmas along the way.